We are on the OTP-PHX run but tomorrow's 8 am BA 6031 to London is delayed by 2 hours. This will destroy our original itinerary as we only have a 2 hour connection in London for our flight to JFK and then further to PHX. 3. If we arrive later than 4 hours with a routing suggested by us (LHR-JFK-PHX) - would we be eligible for the EU261 compensation? Many thanks for your combined input! Is this all on one ticket? And is it an AA ticket (ticket number starts 001) or a BA ticket (125). This light seem trivial, but matters because AA don’t offer ORC but BA do. Do you know what your re-route is yet? It might be a higher value routing, or if on non-one world airlines allow you to ‘double-dip’. AA not offering ORC?? This would mean we lose the TPs with a routing not in favour? What is a "double dip" ? You say "we" are there two of you ? There are two seats on J left on the Finnair flight HEL to JFK (AY5) which should get you back on track but leaving you 80TP down. To arrive in PHX as close to your original schedule as possible, or maximisation of TPs? You mention this is a TP run, therefore I will assume maximisation of TPs if the priority. Here is our original routing. First leg now 2 hours delayed. I would go with it to LHR at least and then see what happens. You don't want to over complicate. This has happened to me before and Finnair could swap aircraft so you change overnight to on-time or just less late and still make the connection. Being stuck in HEL would not be as good for onward options compared to LHR. I have received ORC when I have suggested the routing but frustratingly, they may not rebook you until they know you are late arriving into Heathrow. Regarding EU261, if you choose a routing that gets you there over 4 hours late in preference to one the airline chooses which gets you there within the 4 hour delay window, I recall posts or discussions that say the claim was denied as the chosen reroute was voluntary. I have just posted our original routing. "AY1331 Helsinki - London Heathrow departure at 08:00 will be delayed. Estimated new departure time is: 16.04.2019 at 10:00 . Finnair will contact you if reservation changes are necessary. Arrive at the airport in good time before the new departure time. Check-in and Baggage Drop desk close 45 minutes before the NEW departure time. You can collect a service voucher at airport self-service kiosks or at Finnair Service Desk. For further information and assistance please contact Finnair Customer Service "
One of the disadvantages of an AA based ticket is that they tend to credit for what you actually fly unless you end up rebooked on a service on (e.g.) Delta. In which case they typically do give ORC and you can double dip by claiming from Delta / Skyteam too under their schemes. If you are trying to maximise TPs, and you are OK to arrive a day late you could try and simply rebook everything from London onwards by up to 24 hours later. Getting to JFK tomorrow won't be difficult. 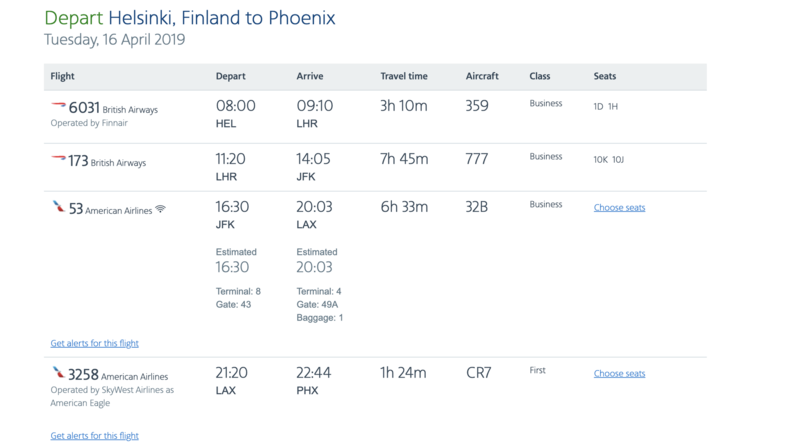 What you need to decide is whether you're OK to forsake 80 TPs by taking the direct Finnair service from HEL to JFK to get back on schedule there; or alternatively do something like HEL-BRU-LHR and then rebook from London (probably meaning JFK-PHX is the next day). If maximising breaks is the key, yes, suggest alternatives to the agents, mostly they'll go along with anything sensible so long as it isn't too far off the line. Also note the possibility of Finnair getting back on schedule overnight if they find another aircraft/crew. Also note there is a HEL-MAN service departing at 08:20, getting to MAN at 09:20, which gets you to LHR at 13:20. Hi gcuk - many thanks for your reply! Expertflyer still shows space on the BA2879 and this is my worry. If AA booked us on the BA codeshare -we would lose 180 TPs ... Thus my question on ORC. Many thanks CWS for the good thoughts. And yes, we are sitting at the Hilton in HEL. What would you predict they do, if we did nothing tonight and just arrived at our flight tomorrow? - but could we perhaps be entitled for EU261 compensation - if in any case we would arrive 4 hours late? Where will you lose 180TP? Codeshare between AA and BA should give same TP.